Each year, companies spend billions on securing their car dealerships construction sites, concrete ready-mix facilities, logistics yards, mines, equipment rental inventories, telecommunication fields and more. Typically, roving security guards are utilized to protect these valuable businesses from intruders and thieves. However, there are many new ways of securing such environments in 2018. We have experts ready to discuss your remote surveillance needs and advise on how video security can protect your outdoor property and valuable assets. Remote surveillance (or remote monitoring) uses an internet connection to take still and video images captured by multiple cameras at your facility and send them to an external remote monitoring station. These stations are engineered to respond rapidly to any suspicious activity in an effort to protect your business and your property from criminal theft or damage. When suspicious or unusual activity is detected by the remote surveillance system, the live feed of the incident will display on the screen at the remote location of trained security professionals. These security experts will then actively monitor the video or photographs of the incident, and manipulate cameras as needed by zooming and maneuvering them to achieve the best view possible. When your remote surveillance partner strategically positions multiple cameras, there are no blind spots in which criminals can hide. Some remote surveillance companies also recommend talk down speakers and strobes that are installed for communicating with intruders, deterring their actions and causing them to flee. However, be wary of speakers and strobes that cause intruders to run away. When this happens, the police cannot make apprehensions and catch perpetrators. Apprehensions are a future deterrent and police say that one apprehension can prevent up to twenty-five future crimes from happening. Regardless of the presence of a loudspeaker, emergency services will be notified by your expert off-site security team along with anyone else you wish to be notified. In 2018 we predict that drones and robotics will have further advances in remote monitoring of outdoor asset sites. Powered by advanced robotics and artificial intelligence, hovering and roaming drones now provide the added advantage of aerial awareness and monitoring of your entire premises. Drones integrate seamlessly into your existing security infrastructure and can be operated by your remote surveillance company. An advantage of drones over stable cameras is their mobility and capability of moving and zooming in on an area needing investigation. This year will bring further advances in technology coupled with an eagerness to cut security costs, while still maintaining superior protection of businesses with outdoor assets. Because of this combination of a desire to cut costs without jeopardizing security will cause business owners, CFO’s and facilities professionals to turn toward newer methods of security. Remote monitoring and advances in robotics and drones will continue to drive up demand for off-site surveillance services. Static standing security guards will soon be a thing of the past for most businesses with outdoor assets, primarily because of the costs and less desirable outcomes outlined below. Static security guards come with high costs and innate handicaps to your overall protection and theft-prevention goals, thus making them antiquated options for securing businesses with outdoor yards and assets. In most cases remote surveillance costs significantly less than paying multiple human roving guards. Some businesses choose to complement a guard’s presence with remote surveillance, either for added security or because a security guard is only present on weekends. 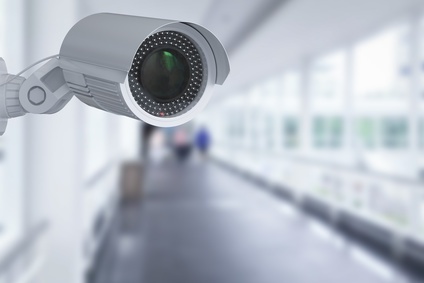 In addition to these disadvantages, plus the added cost of roaming security guards, more and more businesses are turning toward remote surveillance to protect their valuable property. Any business with an outdoor inventory and equipment that is stored outside presents unique vulnerabilities when it comes to security. Preventing theft and protecting fields or storage areas can be challenging and expensive. Motion – this involves video cameras that trigger a human response when motion on the site occurs. This is a cost effective way but every bit of wind, flag movement or innocent activity alerts a designated person. Because of the number of false alarms, the recipient of the notifications can soon easily become numb and disregard all the triggers – even real events and miss them. Camera Surfing – this is just moving the guard indoors. Depending on the operators’ number of cameras and number of sites they have to monitor, intruders can be easy to miss. They can only view each camera area a small percentage of the time. Analytics – cameras are doing the guarding for you at all times. They eliminate the false alarms and the operator only receives an alarm when the cameras detect a vehicle or a person on the site. This is the most effective method but only a few providers have perfected this method . There are some specific industries in which remote surveillance offers the perfect solution. These industries are outlined below. Whenever you’re selecting a remote surveillance provider, make sure any company you’re considering tracks their false alarm rate and apprehension rate. If they don’t track these rates at all, or they do and it’s high for false alarms or low for apprehension rates, then move onto another provider. Associations such as the Partnership For Priority Verified Alarm Response (PPVAR) ensure video and audio verified alarms are regarded by law enforcement as crimes in progress, sending police immediately to your property to stop the criminals in the act. Apprehensions are critical for effective video surveillance and continued rapid response by your local law enforcement. A roaming security guard can only do so much on a large car sales lot. These large and vast areas of space, often times not gated, are tempting areas for theft and damage. Utilizing poles and surrounding buildings, strategic positioning of video cameras that track every area of entry of a car dealership lot are the most strategic and secure option for protecting your valuable inventory. Before the intruder can arrange to carry the tires out of the lot, Radius Security alerts the police that there is a crime in progress, and law enforcement arrive quickly on site. Thieves are quick but with remote video surveillance that’s manned in an off-site facility, the police can be called and arrive on the scene before damage or theft occurs. This protects your car dealership from damage that would otherwise only be uncovered at the start of the workday. Short video clips and GPS data can be delivered directly to first responders in real-time as a crime in progress unfolds. Officer safety, situational awareness and proper use of resources are key drivers in why the experts Radius Security partners with such as Police Priority, Inc. have developed a solution for all law enforcement agencies. Construction sites present thieves with thousands of dollars worth of equipment and materials for the taking. However, protecting your construction or job site with remote video surveillance protects everything from wiring, tools and other materials from theft. Crane climbing is another new trend where people are needlessly putting their lives at risk. Does Video Surveillance Protect From Fire? A surveillance system cannot smell fire or see smoke inside a building. At this time analytics cannot pick up these signals, although technology advances may offer protection in the future. Currently, however, with the speed at which a fire grows video surveillance is not a reliable option for fire protection. What If My Construction Site Has No WiFi? When internet access of a router is not available on a job site, it doesn’t mean remote surveillance isn’t an option. 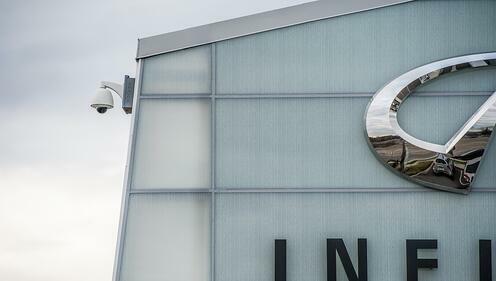 A video surveillance company will always provide their own internet service, as well as often recommend a second service as a back up should one go down. 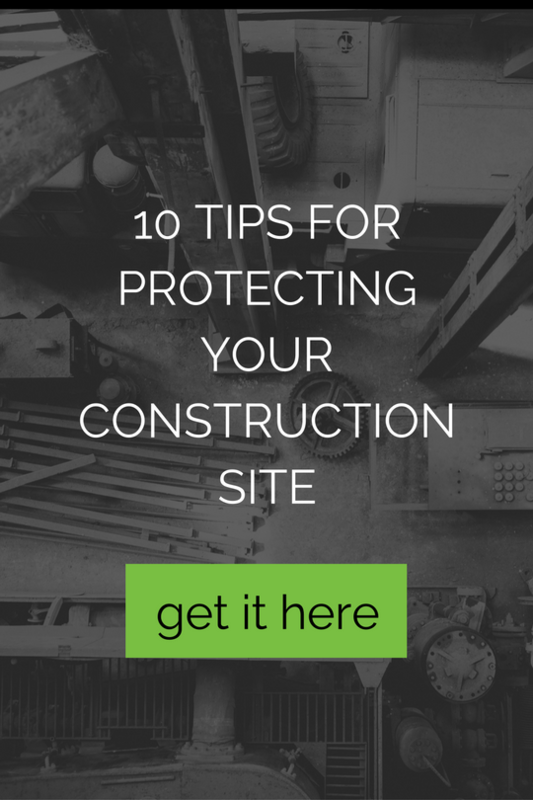 How Can Video Surveillance Protect My Construction Site From Water Damage? Water leaks can cripple a construction project. The impact of leaks that cause water damage, construction delays and financial liability can cost a contractor or property manager millions. 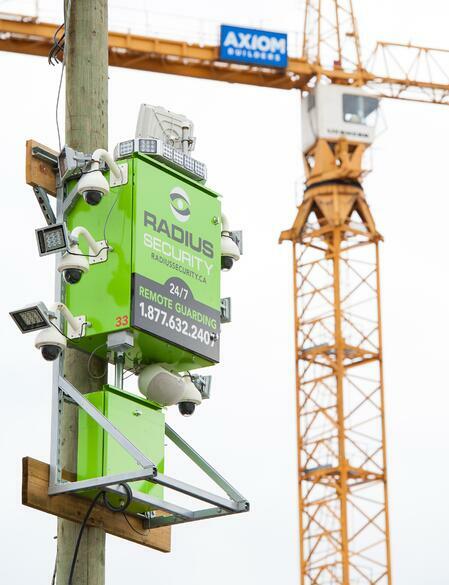 Noah is Radius Security’s revolutionary leak detection and control technology. It monitors water flow rates and alerts Radius’ central monitoring station whenever a leak is suspected. Operators visually verify, via our remote guarding cameras, whether tradespeople are still on site. If the building is empty and the leak verified, the water is remotely shut off to the building and the remaining water is drained in the plumbing stack above the leak. Landscape equipment, road repair vehicles or other heavy machinery equipment is often housed in an outdoor lot vulnerable to theft. Heavy machinery fleet owners are moving toward video surveillance more and more to protect their valuable inventory. Unlike construction sites, equipment rental and heavy machinery lots often have both the power and wifi required to easily set up video surveillance cameras and remote monitoring security cameras. With millions of dollars invested in equipment, you cannot afford to have damage or theft. Video remote surveillance cameras strategically positioned throughout your rental or storage lot will ensure you’re protected. The security company’s relationship with police is everything. If you select a reputable video surveillance company, when the police are called, they know it is a crime in progress and they show up. They’ll be sure to not miss any areas of your lot, especially outlying spaces. Cameras positioned in storage and maintenance areas to prevent theft of valuable equipment that is easier to steal than large heavy machinery. A company with experience in the equipment rental or heavy machinery industries will provide guidance and expertise as to where common areas of theft occur to ensure ample coverage. Remote surveillance companies with superior analytics software will help reduce the number of false calls to police caused by animals or approved staff. Security for your equipment rental and heavy machinery lot doesn’t have to be difficult. We work hard to make it easy for you. Concrete ready-mix and cement supply yards are rapidly growing areas for thieves. Lured by the value of the equipment and the easily accessed materials, these properties and storage yards are rapidly becoming issues for security. Rather than the high cost of a roaming security guard, more and more concrete businesses are turning toward remote surveillance solutions for protecting their valuable cement assets and equipment. Video surveillance is a sound way to secure such areas from thieves. All types of storage yards and parking areas for trucking and logistics companies present security issues for owners. With video surveillance and advanced security analytics software, your security company will see unusual activity like theft from warehouses, distribution centers, trucks, and trailers of cargo and freight. Adding an automatic gate with integrated access control adds significant visibility to your business operations and keep unwanted people out. When integrated with a security system such as Radius Security’s Redhanded Remote Guarding, after hour deliveries and site users can access the site while under the close supervision of the monitoring station and entry exit data is easily available to the customer. Protect your commercial supply chain trucking, cargo, logistics, warehouse, or truck yard business with remote surveillance solutions. As a full-service security company, Radius Security provides end-to-end remote surveillance solutions for any commercial application, including video surveillance and intrusion detection. Whether you operate one storefront or multiple complex facilities, your security strategy begins with intrusion detection. To adequately protect your property, equipment, inventory, employees and clients, we help you first determine your vulnerabilities. And then we secure them using advanced remote surveillance equipment, analytics and solutions. Redhanded™ video analytics software never sleeps and allows the monitoring of your site from anywhere in the world. Video verification reduces false alarms. About 98% of burglar alarms turn out to be false and they drain scarce police resources. When we verify crimes in progress by video, police assign our calls top priority. Redhanded™ means faster response times and virtually eliminates false alarms. Redhanded™ boasts an apprehension rate greater than a 50% and for every two police dispatches, the police will catch at least one perpetrator. This rate of protection is unheard of in the industry.